Some will call me sad – but i have two monthly highlights which come in the form of 2 magazines that I subscribe to: EMPIRE magazine (not about the British Empire, but the mag all about movies), and BBC HISTORY magazine. Well I got the latter at the weekend, and as ever, it is a treasure trove of fascination. Call me ignorant, but until I’d read this month’s edition, I had never even heard of Khazaria. Can you believe that? Huge apologies if that is one of your specialist subjects. But according to the mag’s breaking news section, it seems that archaeologists have discovered the remains of the long-lost capital of Khazaria, Itil – which stood at the Caspian Sea delta of the River Volga (see top right of map – taken from Palestine Remembered). Although Jewish in terms of religion, the vast majority of Khazars were ethnically Turkic. The Khazar empire started to convert to Judaism in the 8th century – completing the process by the mid-ninth century – yet remained culturally Turkic in all other respects throughout its history. This is truly an historical anomaly – i don’t know of another instance of anything like this happening. Perhaps you can comment and fill in my gaps… But the article goes on to provide this helpful background info to explain how on earth this happened. These were the words that the Jewish chief minister of Muslim Moorish Spain wrote to the Jewish king of Khazaria on hearing that far away a Jewish Empire existed. 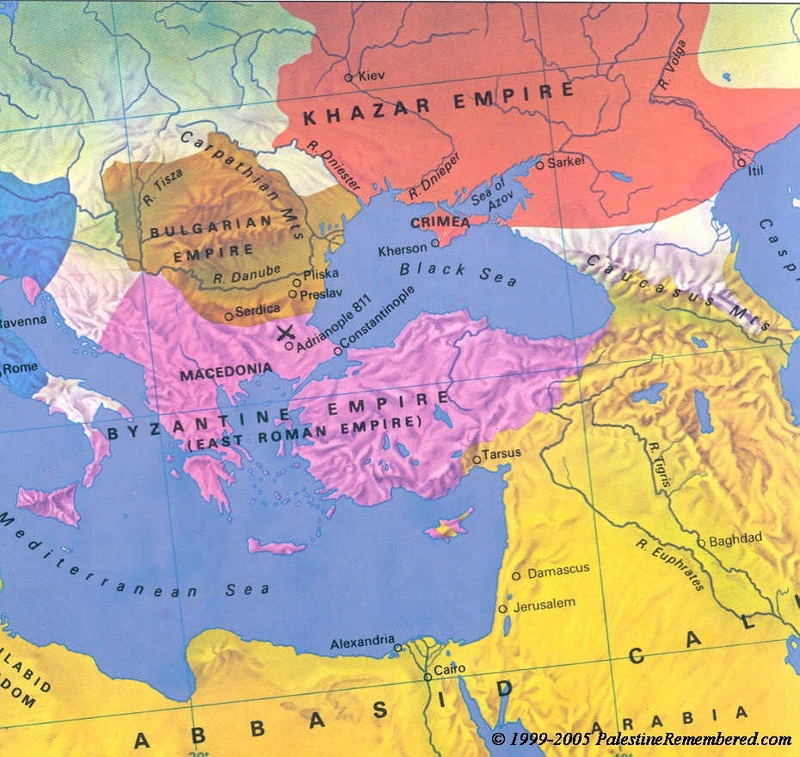 In the 8th century, sandwiched between the Muslim Arab world and the Christian Byzantine Empire, the original pagan Khazar kingdom was under pressure to convert to a non-pagan faith – either Islam to please the Arabs or Christianity to please the Byzantines. Instead they converted to Judaism, so avoided taking sides with Islam or Christianity. At first, Khazar Judaism seems to have been a very conservative version of the faith, accepting the Old Testament, but possibly ignoring the post-biblical Jewish writings of the Talmud. At that stage, it’s likely that only the king and the ruling elite converted. But within 100 years Khazar Judaism had come into line with conventional Judaism and much of the population converted. Following the collapse of the Khazar state in the late tenth century, it is possible that some Khazar Jews migrated west and merged with the medieval European Jewish community. various references and sources also point to the presence of a Muslim imperial guard who protected the Jewish emperor. I don’t have naive or rosy-tinted images of the past as I’m sure there were all kinds of things about ancient cultures that we postmoderns would find (rightly) difficult, uncomfortable or downright abhorrent. But here at least we see what sounds like a model of tolerant mutual respect – or at least it sounds better than what pomos come up with these days (see this previous postings, almost everywhere!). No doubt someone will prove me wrong and come up with evidence for the grim intolerance of Khazars -but even if they did, it wouldn’t shake my concerns about the ways in which the word is defined in contemporary western culture. Sorry if you were not intrigued by all that ancient stuff – but then you didn’t have to read this far! It is true that this was probably a very tolerant state. from my readings of this state the kings asked that the scholars of the three big religions hold a debate and the state converted to the religion of the scholar that gave the best arguments. This is an indication that they was genuine belief that evry opinion matters and I am sure in the debate each scholar had good points. So unlike in the conventional ways people form beliefs not after evaluating various options and chossing what most appeals most people have no choice. Dogma informs the choiice and an unquestioning belief is what is celebrated. If you desire to see the perfect example of tolerance you should read about the mongol empire (founded by Gheghis Khan) though it conquered the biggest empire ever stretching from East Asia (China Indonesia etec) to Eastern Europe. All kinds of religion were tolerated and encouraged. Religious leaders of any kind was exempted from taxes. Within the royal family you the Khans who worship the eternal blue sky had wives and princess derived from all religion and each practiced whatever religion they desired. The Mongol empire of the exampire of what they world could be if tolerance was allowed. They never pretended to be clever or civilied (though they were skilled in War they were mostly illiterate). In this empire intellect and freedom were highly valued.